In addition to the GIS Classroom in Academic West, Faculty and students have a dedicated GIS lab in Bertrand Libary where they can work on their GIS projects and coursework. The GIS Underground is located in Bertrand 020 and has 4 high-powered PCs with ultra-wide monitors. There is also a large 60″ LCD screen that can be connected via Sharelink. The GIS Underground is open during library hours. Once you enter Bertrand Library proceed straight ahead to the central staircase – take the stairs to lower level one. Follow the signs for the Digital Video Editing Lab. The GIS Underground is located next to the Digital Video Editing Lab in room 020. WARNING: If you are using the bucknell_guests wireless network, these steps will not work. Follow the instructions shown on the screen. If you are on a computer, enter the IP address displayed on the bottom left into your web browser. If you are on a tablet or a smartphone, find and download the app that is displayed on the bottom right. If you are on a computer, select your platform and you will be prompted to install a program. If you are asked for a “code”, enter the number from the bottom right of the screen. 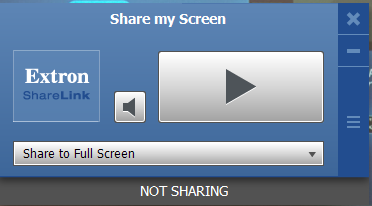 Click the big “Play button” to share your screen on the projector. The method for doing this from your smartphone or tablet is similar; upon opening the ShareLink app, you will be prompted for an IP and a Code, which you can get from the bottom left and bottom right of the screen, respectively, as with the computer. You even have the option to display the view from the camera on your phone on the screen, or just display what’s currently on your phone.For additional information or assistance, please contact the Tech Desk at 570.577.7777 or techdesk@bucknell.edu.